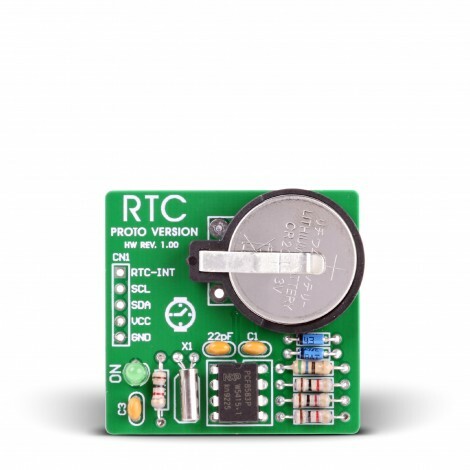 The RTC PROTO Board enables you to connect your prototype device with a Real-Time Clock (RTC). The board features the PCF8583 clock/calendar circuit based on a 2048-bit static CMOS RAM organized as 256 words each consisting of 8 bits. RTC PROTO board enables you to use a real-time-clock and calendar in your applications. It features an PCF8583 that keeps track of the current time even when the microcontroller is turned off. The real-time clock is driven by a special battery that is not connected to the normal power supply. It is easily connected to standard prototyping boards. Key Benefits Easy integration into your prototype or final device. Clock function with four year calendar.